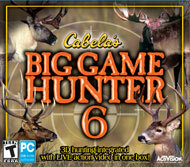 <br>Cabela's Big Game Hunter 6 introduces the choice between live action video and state-of-the-art 3D hunting in one game. When you're not trophy hunting, you can test your marksmanship on rabbits, squirrels, raccoons, coyotes and opossums. Your outings will span Colorado, New Mexico, Mississippi and Canada and allow you to explore a variety of realistic terrains in each state. Authentic Cabela's gear including lures, calls, cover scents, rangefinders, decoys, hunting blinds and treestands will aid you in harvesting that trophy of a lifetime. Driveable vehicles make it easy to reach your hunting destinations quickly. An expert hunter will give you advice before you hit the field and a game warden will make sure you abide by the hunting laws and regulations of each state.